Titles are confusing: How many people run federal government tech? Guys, the talkies are on! 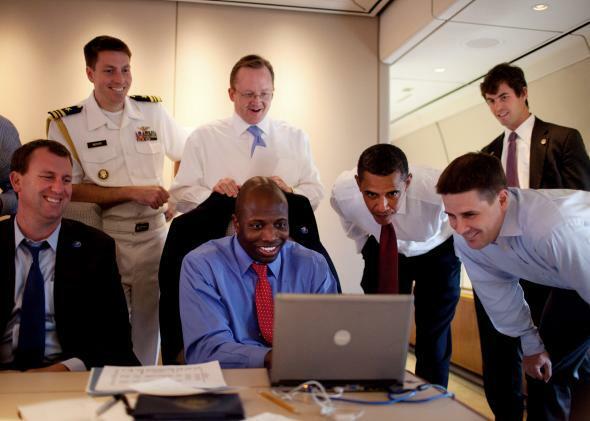 On Thursday, the White House announced a new chief information officer, veteran information technology manager Tony Scott. The position was previously held by Steve VanRoekel, but he switched to working on Ebola response back in September. Meanwhile the administration appointed a new White House cybersecurity coordinator in August, after longtime advisor Howard Schmidt departed. But what do these people do? And who else do they work with? It turns out that it takes a lot of browser tabs to answer those questions. The first thing to realize is that pretty much everyone has multiple titles. For example, White House cybersecurity coordinator Michael Daniel is also a special assistant to the president. This is because bureaucrats who primarily manage tech are the liasons for different agencies and departments. Also, of course, people work on different aspects of tech, so information technology management has a different purpose than cybersecurity work or social media programs. The breakdown basically goes like this. The Office of Management and Budget (which is under the overall umbrella of the Executive Office of the President) contains a “statutory office” called the “Office of E-Government & Information Technology.” The United States chief information officer heads this office and does network planning while also overseeing federal technology spending. It’s all laid out here. When it was created in 2002, the CIO job was known as the administrator for e-government and information technology, but the name got updated in 2009, perhaps because “e-government” is a hilariously outdated phrase. Keep in mind that there are chief information officers for basically every agency and department (for example the Department of Transportation or the FBI). To coordinate all of those CIOs there’s a Council of Chief Information Officers that works along with the U.S. CIO to promote things like systems interoperability and strong security across all federal networks. The Office of Science and Technology Policy—created by Congress in 1976 to advise the Executive Office and coordinate between agencies—has multiple tech-related sub-offices, including the Office of the Chief Technology Officer (led by U.S. Chief Technology Officer Megan Smith), the Technology & Innovation Division (currently led by Deputy Director for Technology and Innovation Tom Kalil), the National Security & International Affairs Division (which includes Assistant Director for Cybersecurity Tim Polk), and the National Science and Technology Council. People within these offices tend to have confusingly similar titles that are also reminiscent of people’s titles in other divisions. You have to look at the full breakdown of the hierarchy to really get a sense of who’s who, and even then it may still be more appealing to curl up in bed and watch a Futurama marathon instead of trying to figure all of this out. But pressing on: There’s also the U.S. Digital Service, which was formed in the wake of the healthcare.gov rollout fiasco. The service works as a sort of consulting group to help agencies create strategies for individual issues. It’s led by administrator Mikey Dickerson, who formerly worked at Google and is also deputy federal chief information officer under Tony Scott (see above). The White House’s Office of Digital Strategy is essentially its social media team and also works on transparency and access to government information. Though this team works on achieving goals from the administration’s 2012 digital government strategy plan, it isn’t the only group doing so (in spite of the similarities between the name of the office and the name of the document). Other road maps for tech implementation in the Obama presidency include Executive Order 13571 from April 2011 and Executive Order 13576 from June 2011, which both deal with transparency, efficiency, and innovation in the government’s interactions with technology. The Digital Strategy team is one group that attempts to promote collaboration with the private sector, a major administration goal. In terms of digital protection, the cybersecurity coordinator (currently Michael Daniel) works with agencies to develop and implement cybersecurity policies and initiatives. The Department of Homeland Security also contributes to cybersecurity initiatives through its Science and Technology Directorate, which includes a Cyber Security Division. Many other agencies do cybersecurity work as well, like the Office of Science and Technology Policy and the FBI. Perhaps the most (or only) amusing thing about the whole setup is that the NSA has a cybersecurity division called Information Assurance. In the White House, technology policy and implementation have largely been driven by Obama’s statement, “I want us to ask ourselves every day, how are we using technology to make a real difference in people’s lives?” There’s been progress, but no one will be calling the federal government’s tech strategy “nimble” or “lean” any time soon.